Pinterest – A Place to Pin all of your Interests! Ever wanted a way to catalog your favorite things? Whether it be books, movies, inspirational pieces, fashion, or your precious hobbies, Pinterest may just be what you’re looking for! Catalog all the things you love in a beautiful and visual way. Looks like I may to redesign my page to fit the New Twitter better. It looks nice. I really love the top bar because all the things I want to get to are right there. But the right column is a bit too wide for me. I like to have my browser narrow so I can work on other things while reading Twitter. The part that I love the most are the messages. The redesign is wonderful! 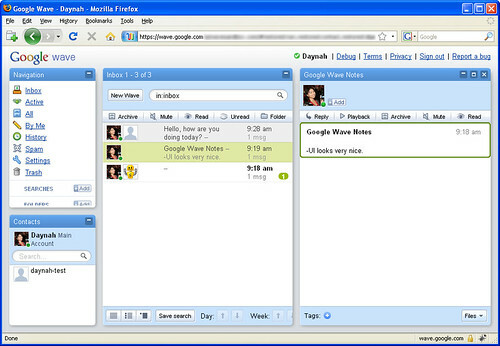 It makes sending and finding old DMs much easier. The new “send a tweet” feature is nice too. The pop up reminds me of an iPad app interface. 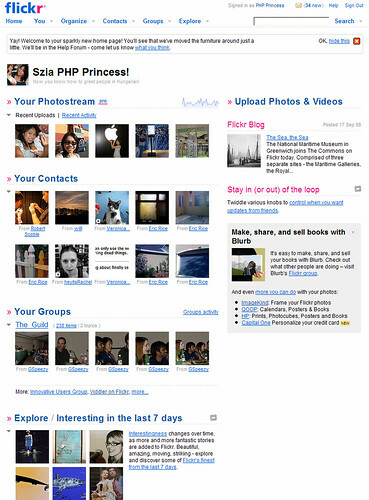 Overall, I like the redesign. Still keeping it simple by adding subtle changes. Thanks Twitter! Now be honest, when you see a beautiful dessert, can you refrain from snapping a photo of it? If you watch the Food Network, or just enjoy food in general, this community is just for you! It’s called FoodSpotting — a fun social network with food-snapping users who share their daily dishes through photos and reviews. The website is fun to browse, but it’s much more fun to share your eateries while you’re on location. That’s why there’s a fun iPhone app for that! There are 5 major functions on the iPhone app — Browse, Find, Spot, Guides, and Profile. Let’s step through each one. Browse. This is a photographic way to see all the foods around you! The app uses the gps to find photos of food taken near your current location. This makes it easier to find restaurants if you see something you like. The photos are displayed in a fun slideshow of postage stamps that you can swipe back and forth. See a food item you like? Tap on it to see the person’s review, their review, and the location of where you can get it. You can also tag the photo with “Want It,” “Nom it”, add in your own photo, or even leave a comment for the foodspotter. Find. This option displays a list of restaurants that are near your current location. Click on a restaurant and view photos of the dishes taken there along with their reviews. Click on the photos for more options (similar to the Browse feature) — “Want it,” “Nom it,”, leave a comment for the foodspotter, and more. Spot. This function is what makes the app. When you’re at a restaurant or eatery and your food comes out, click on “Spot.” It’ll prompt you to select or take a new photo of your dish. Once you pick an option to add a photo, also select the restaurant location and type of food on the top. After, click on “Add sighting” and your food photo would automatically be uploaded on the site for all to see and nom! You also have the option to connect to your Facebook, Twitter, and/or Foursquare accounts when uploading. Guides. If you follow the Food Network and/or the Travel Channel, you’ll love this feature. Let’s say for example, you enjoy the restaurants Anthony Bourdain visits. You can follow one of his city guides on Foodspotting and it’ll list restaurants he visited in that city. You can then eat everything he ate! Add your own photos to complete the guide. Other guides include ones created by Zagat, Top Chef, Food Network, Travel Channel, 7×7 Magazine, and many more. Profile. This section displays your Foodspotting user profile. The first page displays your recent activities, foods your spotted, foods you wanted, guides you’re following, and how many people you follow. Tap on the options to drill down deeper. Overall, Foodspotting is a great app to really tie the Foodspotting community together. It makes it much easier to share, rate, and leave comments on food photos while on the go! So sign up, have fun and Bon Appetite! I want to see what you eat! FoodSpotting for the iPhone is available for free in the iTunes App Store. Question: I have set-up/configured our Facebook, Twitter, and Blog this week. We are in the process of posting content to each, but I was hoping you could go over a few things with me. Mainly, how to integrate the 3 so that we donâ€™t have to constantly update all 3 sites? And also, based on your experience, are there any general settings in each dealing with user interactivity that we should enable/disable? Answer: I would first start with integrating Twitter into Facebook, instead of the other way around. 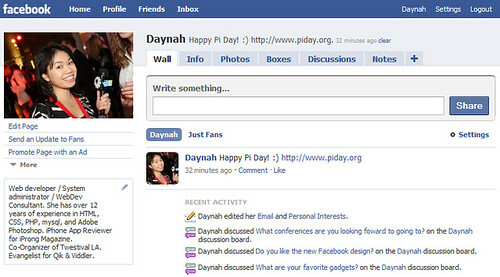 The reason is because I think students are more familiar with the Facebook interface than Twitter. In a browser, log into Twitter. This is another official update to the original “Shift Happens” video. I really enjoyed it because it’s filled with all sorts of statistics from the new media generation and technology shift. This is another official update to the original “Shift Happens” video. This completely new Fall 2009 version includes facts and stats focusing on the changing media landscape, including convergence and technology, and was developed in partnership with The Economist. For more information, or to join the conversation, please visit http://mediaconvergence.economist.com and http://shifthappens.wikispaces.com. I enjoy reading books with topics in sci-fi, fantasy, technology, social media, library 2.0, and scrapbooking. Come join me on Shelfari. I’m also on GoodReads and LibraryThing if you prefer those book social networks. So what can make me more happier than having a new shiny toy to play with? Joining a social network built around a community of shiny gadgets of course! I joined gdgt today and absolutely love the concept and community. The website is run by Ryan Block and Peter Rojas — two amazing gadget gurus, along with with the rest of the gdgt team! So how does it work? My friend Veronica will tell you how! I wanted to find out what were your top iPhone/iPod Touch apps. If you don’t count Mail and Safari, my top 5 favorite iPhone/iPod Touch apps are Twitterfon, Brightkite, Dizzy Bee 2, Chop Sushi, and iHeartRadio. Ok, I’m sneaking one more in — Facebook because it makes poking people easy! Ha! claycarnill: @daynah tweetie, idracula, Tumblr, google, and scoops. bilalnaseer: @daynah My 5 Fav. #iPhone #Applications are: ‘Pandora’, ‘USA Today’, ‘Beejive IM’, ‘Kindle’ & ‘Things’. Yours? NctrnlBst: @daynah twitterfon, shazam, BrightKite, showtimes, remote. “Did you get my tweets? I just twoted all over the place!” Funny! Thanks @cloud79 for sending it to me! Facebook changed their design again and I really like it. The main focal point is now the status update, which does remind me of Twitter. I believe this new change will help create more conversations though. Having the groups on the left is very nice. Now I can separate status updates by groups which is one thing that twitter is missing. There’s a lot of data on the right side that it seems a bit cluttered. But it doesn’t bother me too much. I like to glance at it to see what’s new. I would prefer the “pokes” to be moved up though. They seem lost being so far at the bottom. Discussions option! It’s a great place if you want to ask me tech questions and such. 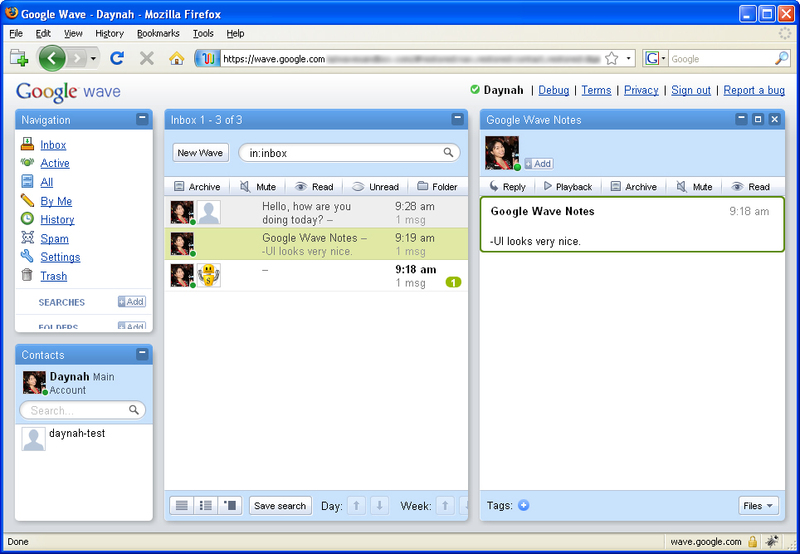 And this social network seems to be more manageable than a Ning website. So if you’d like to interact with me, please add me here on facebook. Thanks! The new Skittles.com redesign is an interesting approach to creating a website. It take social media to the extreme! Every link you click on leads you to popular social media website. 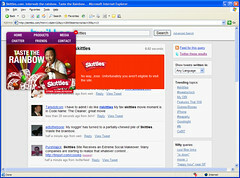 The products page now points to their Wikipedia, their media page takes you to YouTube and Flickr, Chatter takes you to a Skittles Twitter search, and Friends take you to Facebook. The longer I sit and watch the Twitter search page refresh itself, the more I think this is a bad idea. 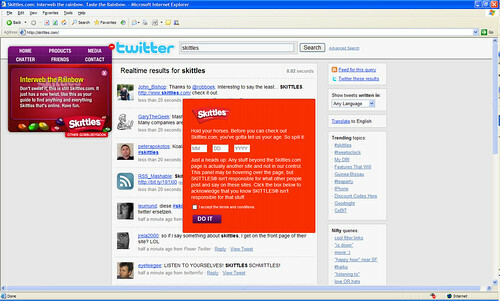 Any mention of the word “Skittles” on Twitter gets displayed on the website. And since this is a candy company, I think it should be more geared towards children more right? The website does ask you for your birthdate before you can enter the website. I put in a date that would make me 5 years-old. Since I’m too young, the only thing that gets displayed is “No Way, Jose. Unfortunately you aren’t eligible to visit the site” yet, the Twitter stream still refreshes in the background! A simple fix to this is to display the YouTube page or something else instead. But honestly, I think they’re targeting the wrong audience for their website.. Although Twitter is slowly hitting the mainstream, not everyone knows what Twitter is yet. So the new website would appear quite confusing for a majority of visitors. Brightkite for the iPhone from Brightkite on Vimeo. I just realized I never blogged about my favorite webisode! After seeing Mahalo Daily’s report on Comic-Con, I discovered an actress named Felicia Day who did a webisode series called The Guild. I watched episode 10 one night and loved it. I ended up staying up the rest of the night to watch all 10 episodes! Totally loved it! The characters reminded me so much of my close friends! The Guild is a independent sitcom webisode about a group of online gamers. It is written for gamers, about gamers by a gamer. Episodes vary from 3-6 minutes in length, and follow the Guild membersâ€™ lives online and offline. â€œThe Guildâ€ is the winner of the YouTube and Yahoo 2007 Video Awards for Best Web Series, as well as recipient of the SXSW/On Networks 2007 Greenlight Award for Best Series. Here are all 10 episodes. Let me know if you enjoyed it as much as me! Season 1 – Watch all 10 Webisodes! I really like Facebook’s new Hint popups. They’re the little yellow boxes all around the web interface. 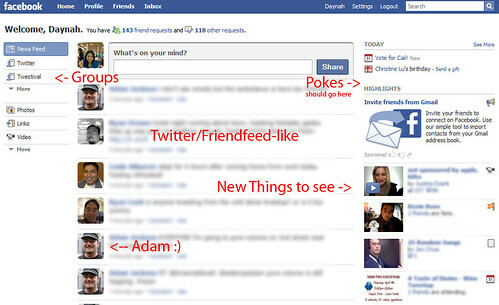 I know a lot of my friends had trouble getting use to the Facebook layout, so I hope these help! And I do love how the Applications Menu moved down to the lower left. Reminds me of Windows, and apps are much easier to get to. You can rearrange them by clicking on the icons and drag-and-drop, just like the Windows Toolbar! How to share anything on the web from Dan Hsiao on Vimeo. Step 2: When you are on a webpage you like to share, click on the bookmarklet. As you are adding a comment, you can hover over images on your webpage to include it on your post. You can include up to 3 images. I’m loving the new Delicious website! Even the domain name is easier to spell. ;) I use to google my own site because I couldn’t figure out where all the periods went. haha But I’m very happy with this new website upgrade. It’s about time. There’s been other bookmarking websites, but this is the one I always come back to. I only bookmark technology websites, so if you’re interested in that, be sure to add me to your network! Thanks for the video link, Kevin! A surprising thing happened at work today. We were hit by a semi-big earthquake earlier in the morning. I know I should be use to earthquakes by now, but this one was hard and kept rolling! It must have been the longest 20 seconds of my life. My first reaction was to duck and cover under my desk. When the rolling stopped, I tweeted. Yes I know. How geeky huh? Hey, twitter gets you the news as it happens! I was a quite shaken up. I then noticed a flood of tweets about the earthquake, one being iJustine, who just happened to be in LA, and feeling an earthquake for the very first time. Us Californians really know how to welcome someone!